The Prophet Micah, detail from the Ghent Altarpiece by Hubert and Jan van Eyck, c. 1432. The inscription reads ex te mihi egredietur qui sit dominator in Israhel, or "From thee to me he comes forth who will be ruler in Israel." Whenever I hear the expression "voice of an angel", Kathleen Battle is the first person who comes to mind. The world is not as just, not as loving, not as whole as we know it can and should be. But the coming of Christ and his presence among us — as one of us — give us reason to live in hope: that light will shatter the darkness, that we can be liberated from our fears and prejudices, that we are never alone or abandoned. Now muster your troops, O city of troops; siege is laid against us; with a rod they strike the judge of Israel on the cheek. And he shall stand and shepherd his flock in the strength of the Lord, in the majesty of the name of the Lord his God. Micah lived roughly 700 years before the birth of Christ. Here he predicts that the savior of Israel will be born in the tiny town of Bethlehem Ephrathah. There were two towns called "Bethlehem" in Canaan; one of them had been previously called Ephrathah, so Micah uses the word to specify which of them he meant. And there is no confusion — this is the exact town in which Christ was born seven centuries later. This passage is, truly, one of the great miracles of the Bible, for it is historically proven that the prophesy was made prior to 701 BC, when Micah died. 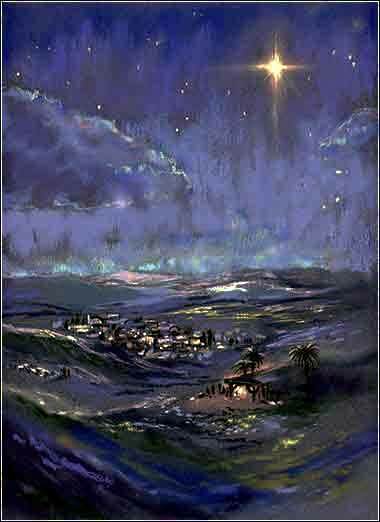 The birth of Jesus of Nazareth in that very town, and his role as the savior of Israel (and all of humanity), standing and shepherding his flock in the strength of the Lord, "great to the ends of the earth", can be nothing except the fulfillment of this ancient prophesy.